Funny how lately it takes me longer to get socks blocked and ends woven in than it does to knit them in many cases? I finished these socks, made from my X-mas gift yarn before new years, but with the extra long week back to work, I only managed to completely finish and photograph them now. I find with the short daylight hours, it is difficult to take good photos with any semblance of true colors? I am waiting for a nice sunny day to really get at it and take pics like crazy one of these days. This was a nice quick-and-painless knit? just the kind a knitter needs post-holiday. 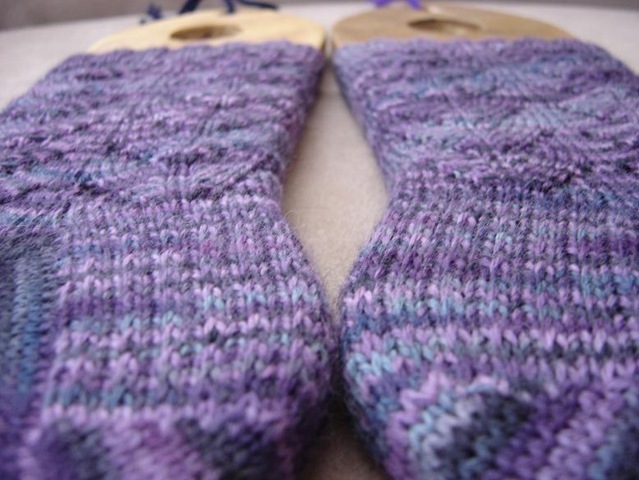 The pattern was well written (Dragonfly Socks by Jocelyn Sertich) and easy to follow along. I think this one will find it's way into my standby-list for straightforward socks suitable for travel knitting. The pattern was great? but the yarn was something else. I have always loved purple. Purple is a great color to work with? nice in every type of natural and artifical light, and the variegation in this skein gave a nice mix between flashing and pooling - it was fun to knit a few rounds and see how the colors stacked up. I do like solid, and semisolid yarns, but these pooling types are fascinating to me. I saw a neat discussion on ravelry the other day all about "intentional" pooling on socks, and I think I would like to try it someday. 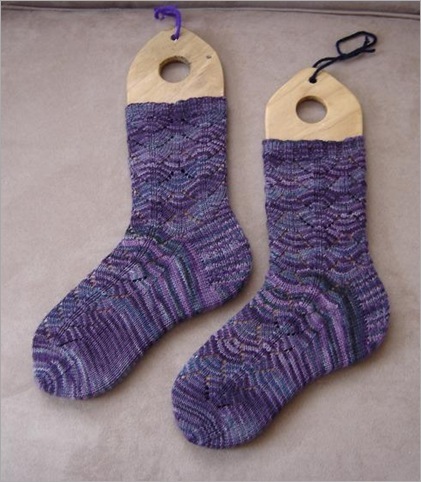 A sock artist (Hypercycloid) measured how many inches of yarn it took her to knit one round of her basic sock pattern on a specific needle size and then divided that length and tried to dye a skein to achieve a pooling effect where each color would stack onto itself. The resulting socks did show a lot of stacked pooling, and seriously look like a map or something. If you have any friends who are cartographers? this yarn would make an excellent and geographically appropriate gift *wink wink* I know not everyone is a real fan of pooling, but I think that those of us who like it REALLY like it. Someday maybe I will be able to do more experiments like that and see what I can come up with. Another Feather and Fan Shawl... Looks Like Butterfly Wingsfiber, merino, tencel, blend, fiberoptic, spinning, handspun, 2-ply, lace, shawl, feather and fan, B...Almost too pretty to Knitty!... Dragonfly Fibers Sock YarnWho doesn't like looking at pictures of pretty yarns? seriously? come check out this beauty from D...Sock Wars V: The Countdown is on... Are YOU ready for the Carnage?The Countdown is on for Sock Wars... Are you Ready for Knitterly Carnage? Your website came up in my search and I'm taken by what you have composed on this topic. I am presently diversifying my research and thus cannot contribute further, even so, I've bookmarked your web site and will be returning to keep up with any future updates. Just Now. I love it and thanks for granting my remark. Should I get a Virtual Private Server? At the moment I am using fatcow but they keep turning off my websites due to high server overload. Im getting about 4,000 UV a day. What brand should I get?